One of the City’s most important mid-seventeenth century buildings, composed of ten bays of two low storeys, but with a four-storey central tower. 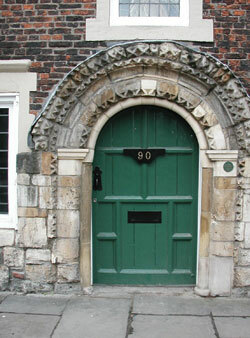 The middle doorway is late Norman and has been moved from another site, reputedly Holy Trinity Priory. It is round-headed and has several orders of dog-tooth moulding. 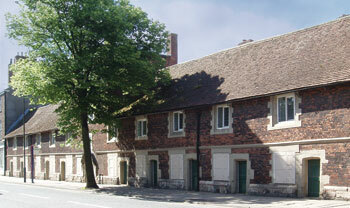 A pre-classical brick building with a large traditional walled garden, it was erected c. 1635 – 40 by Sir Arthur Ingram as almshouses, known as Ingram Hospital. 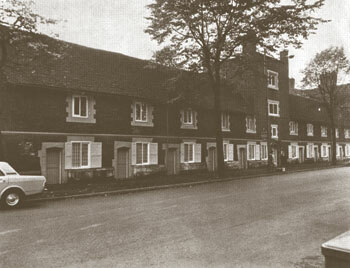 Ingram Hospital was purchased by Ings Trust Ltd (now York Conservation Trust) in 1957, and in 1959 was converted from a series of almshouses into four modern flats under the name of Ingram House. Though the purpose of the place was to provide untroubled repose, the house began its career in a stormy period; only four years after its completion came the Siege of York in the Civil War. As it stood some distance outside the city walls, the house was for some time at the mercy of the Parliamentarian forces. It must have received damage from both sides, and the account for the repairs in 1649 is still in existence. The building is of brick with tiled roofs. Projecting S.W. from the back of the tower, a single storey wing contained the chapel. The ranges to each side have stone plinths, doorways with four-centred stone heads, ground-floor windows with stone dressings, a brick band at first-floor level and upper windows with stucco dressings. At the back, the projecting chapel wing is finished with a curved Dutch Gable beneath which modern brickwork covers a window of four lights with plain uncusped tracery in a two-centred head. 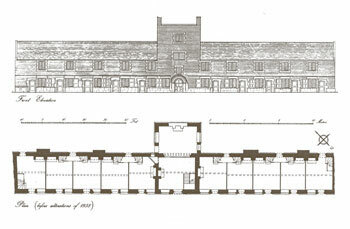 Each wing has two projecting chimneystacks and three doorways with four-centred brick arches. The ends of the two wings are now masked by higher later buildings, but some remains of a curved Dutch Gable can still be seen at one end. Inside, the partitions between the rooms are timber framed with brick filling between the studs housed into grooves cut in the sides of the studs. The original fireplaces had brick arches but these were covered in the late 18th or early 19th century by stone surrounds within which were placed iron ranges with ovens all enriched with a variety of raised patterns of panels with foliage, thistles etc. The staircases were reconstructed probably in the 19th century. The roof is carried on collar-beam trusses with purlins clasped between collars and principals and receiving additional support from intermediate collars and brackets fixed to the underside of rafters. Sir Arthur Ingram was a Yorkshireman, born at Thorpe-on-the-Hill, near Leeds. He became a linen draper in London and married the daughter of a rich haberdasher, Richard Goldthorpe, who had been Lord Mayor of York and the MP for the City. Later Ingram was able to buy the manor of Temple Newsam and build the magnificent house which still stands there. In 1612 he was appointed one of the Secretaries to the Council in the North, and was knighted a year later. He was MP for York four times, beginning in 1623, and High Sheriff of the County in 1620.